Temperance Hill is a name familiar to anyone with a taste for Oregon Pinot, as it is a named designate for many top wineries, including Adelsheim, Bergstrom, Evesham Wood, J.K. Carriere and St. Innocent. Dai Crisp is in the enviable position of managing the vineyard and purchasing some favored blocks for his Lumos label, and he shared a bottle of the 2010, with bright strawberry and raspberry fruit, lovely balance and acidity, and warming brown spices. At Sokol-Blosser Pinot for the 2013 Rosé was being picked, and a bottle of the 2012 was among the wines tasted. I found it ripe and rich and quite delicious; Alex thought he'd waited too long to pick and was more excited about the grapes pouring into the destemmer as we chatted. We rode an ATV to the Eyrie vineyard nearby, where Jason Lett entertained with stories of his late father David Lett, who is widely-credited with having founded the modern-day wine industry in the valley. We marveled at the original Pinot Gris vines, some dating back more than four decades, and still bearing, while drinking a just-bottled "Original Vines" 2012 Pinot Gris. Rich and yeasty, it was alive with old vine minerality and depth, truly gorgeous. 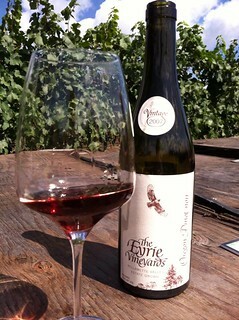 But even better was the 2007 South Block Pinot Noir, from the most-famous section of the vineyard. David Lett never released most of his South Block wines, but at a memorable tasting a couple of years ago, Jason poured them all, and they all proved to be worth hoarding. Somewhere on this blog are my notes from that event. I took almost as many notes and photos of food as I did of wines during the day, as we were treated to fine, picnic-style feasts whenever the wine tasting had pushed appetites to the limit. Special kudos to Jody Kropf of Red Hills Market, Scott Dolich of The Bent Brick and Park Kitchen, and Aaron Woo of Natural Selection. I look forward to dining at all their restaurants again soon. An afternoon tasting at Shea Vineyards, another spectacular site with an honor roll of clients, was highlighted with bottles of 2008 Block 7 and 2008 Block 5, 2009 Shea Estate, 2010 Block 23, 2011 West Hill and 2011 Homer. Impossible to pick a favorite – these were all wines I wanted to spend a day with, not a few brief minutes. We wrapped up the day with a tour of Archery Summit, as the full moon was rising, followed by a spectacular Aaron Woo dinner in the caves. The wines included a shockingly good 2012 Ab Ovo (from the egg) Pinot Gris; a 2010 Arcus Estate, and a 2008 Red Hills Estate. My deep appreciation to Matthew Domingo, who organized the day's events on behalf of Travel Oregon, and to all the vintners who so generously hosted us during the busiest time of their year.